Our new full-fledged website is now live and accessible. Just click on the link at www.myownhomemoscow.org to go there. When you do, you can use the online forms to sign up to become a member and/or volunteer. By joining before February 29th, you'll receive an extra three months for free and your membership year won't start until services begin. My Own Home is pleased and honored to be awarded the Moscow Food Co-op's "Dime in Time" grant for the month of December. Co-op shoppers can show their support by remembering to bring their reusable bags and asking the cashier to donate their dime refund. Our new Executive Director, Tom LaPointe, and board member, Cathy Porter hosting an information table on 10/8/11. My Own Home is pleased to announce it has hired Tom La Pointe as its inaugural executive director. La Pointe served for more than 13 years as executive director for Valley Transit and during his tenure more than tripled that organization’s services, reach and budget. With his skills and experience on board, My Own Home is confident it can fulfill its goal of becoming a vibrant and viable service provider for its members. Board members Nancy Lyle, Barbara Wells and Cathy Porter are shown at this year's Senior Fair held June 1st at the Palouse Mall. Being there gave us a good opportunity to provide information about the mission of My Own Home and, in turn, to hear what types of services people thought were needed. We are happy to announce that the IRS has recently determined that My Own Home, Inc. is a 501(c)(3) tax exempt organization. This means all donations are tax deductible, including those made since February 9, 2009, the date we formally incorporated as an Idaho nonprofit corporation. You can help us get started by making a donation now to: My Own Home, PO Box 9484, Moscow, Idaho 83843. Your support is much needed and greatly appreciated. My Own Home is a non-profit organization based in Moscow, Idaho. We're new, just established in January. 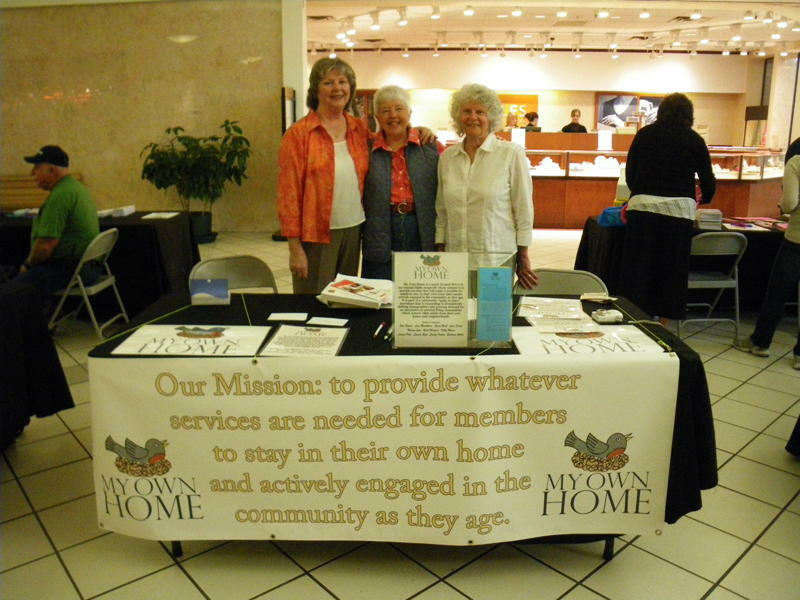 Our mission: to provide services that will make it possible for adults to continue to live in their own home as they age. We hope to begin offering services within a year. Our goal is to make it easy and affordable for our members to make one phone call to a centralized source to get whatever service they might need when they need it. Like other "aging in place" initiatives nationwide, this grassroots effort is a response to shifting demographics and growing demand for an alternative to assisted living. We are inviting Moscow residents to participate in a survey that will help us know which services are most important and to gauge the interest of potential volunteers, donors and vendors. We believe it will take a village to make it possible for all citizens to have the opportunity to be fully engaged in our community—regardless of age! My Own Home is a non-profit organization based in Moscow, ID. Its mission is to provide services that make it possible for adults to continue to live in their own home as they grow older. In this way, they will have the opportunity to remain actively engaged in our community's vibrant civic and cultural life. Please take our online survey and tell us what you think. It will take just a minute or two. Answering these questions will help us organize for success. We appreciate your input. Today, there are more than 35 million Americans age 65 or above. Over the next 25 years, the number is expected to double, and one in every five Americans will be age 65 or older.